Who celebrates Valentine’s Day most certainly? The advertisers and marketers! After the Black Friday, Christmas/ New Year holiday shopping sprees, January tends to be a dark and gloomy period. Easter is too far, no major events on the horizon. Then Valentine’s comes quite conveniently for marketers. It’s funny to watch all kind of businesses trying to make a Valentine’s campaign, regardless if their product has to do with love: burgers, rental cars, even insurance can be Valentanized. Any why not? The end campaigns can be funny, quirky and most importantly, quite effective. 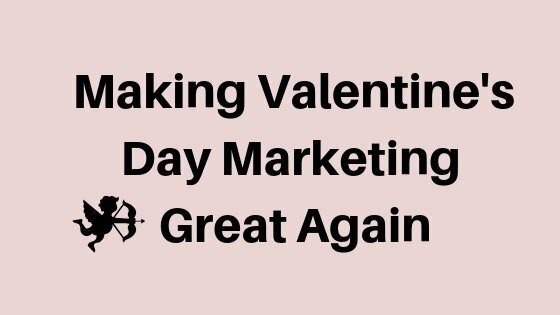 When to start your Valentine’s campaign? Exploring the trend is really important to find out when people start looking for Valentine’s day presents. Here is a screenshot from Google Trends – a free tool from Google which helps you identify search trends over time. You can search individual keywords, but also a group of searches bound together in topics. We can see there is an interest in the topic of Valentine’s Day since mid January, but the first spike starts on the first of February. You can also scroll down to explore the rising terms to understand what is happening. 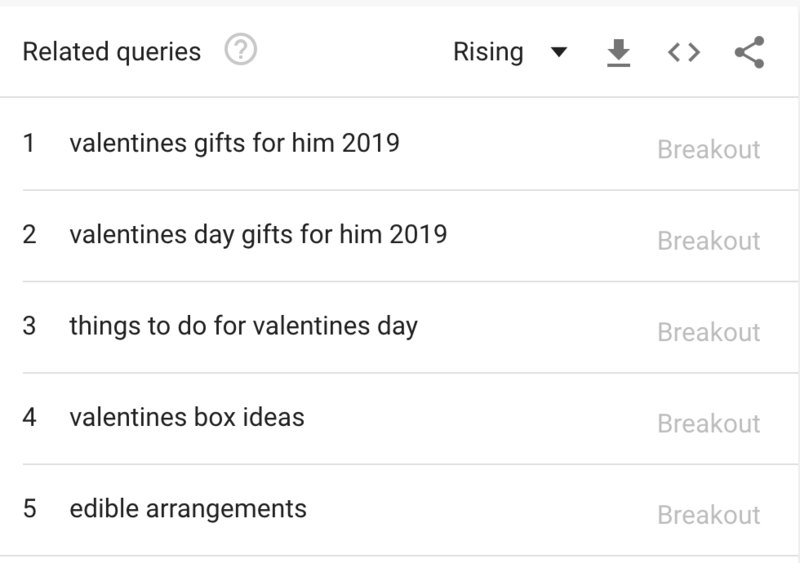 We can compare that this year in the USA there is a significant rise of searches for “gifts for him” as well as activities to do on Valentine’s. Looks like the overall planning of Valentine’s started much earlier than in the UK. British started a bit of a last moment research primarily for Valentine’s-themed postcards. Still interestingly “gifts for him” has been also a popular search. What this information tells us is the overall trend. We know when the campaign has to be started and also when to expect the biggest volume of searches coming. Maybe even tailoring the product to the type of searches. For example, a more last-moment market like the UK, would benefit from “quick fix” type of presents, fast delivery, leftover ticket and booking deals. You can easily spot trendy products like the “rose bear” – teddy bear toy made out of fake roses. It seems like Valentine’s nail ideas and themed photoshoots also spiked in the UK – great insight for beauty salons and photographers. 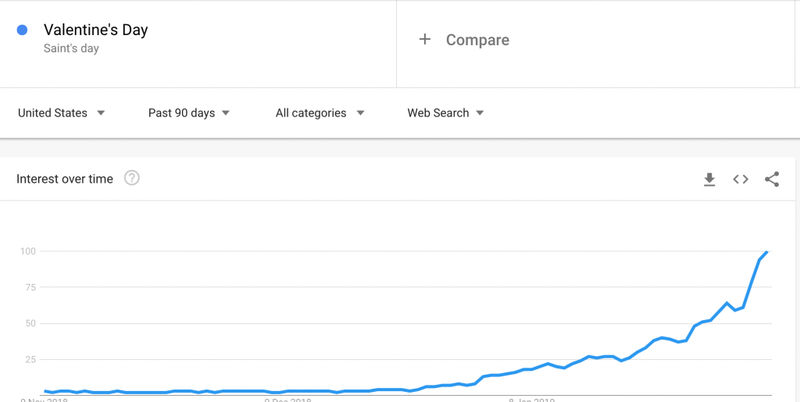 Trends gives you an overall view of terms and major trends, but you can get really nerdy with Google Ads keyword research. Since recently the keyword tool has improved by adding suggestions which do not contain the exact words you tried. Let’s say I put Valentine’s day gifts as a search term. I get suggestions about long-tail search terms, which I can use for targeting these users. From the keyword suggestions, I get also the impression presents for men are much more trending than those for women. This can help me develop a strategy to offer gifts suitable for man as they seem to be much more in demand. This is contradicting the assumption that women tend to get a lot of gifts for Valentine’s. Finding a gift for a man is much more difficult and the data shows that the market demands more options and solutions to this problem. Now when I have the timing of the campaign, the most popular products it is time for me to find who these buyers are. One way of doing is to analyse a campaign with broad keyword targeting and generate information from the traffic on the landing page. This can be an early experiment to adjust targeting toward the peak period. The best option could be if you have data from previous years when you ran Valentines campaigns. It could be based on data you generated from a different channel – Facebook, Instagram, Twitter. If you have been using a specific landing page for your Valentines campaign, you can create a remarketing audience using Google Analytics. To explore the demographic of your audience, proceed to the Audience Insights report in Google Ads or use the Audience section in Google analytics. There you will understand about users on this list: if they fall into unexpected affinity categories and in-market segments. You can also get basic information like age group, gender, parental status. To get this information you need to generate a big enough list (over 1000 users). Otherwise Google will hide the data to protect the identity of the users. If you are doing analysis on a Facebook audience you can get similar insights, as well as which Facebook pages these people like, how frequently they use Facebook. Finally to understand where these audiences spend their time online you can use several tools. This would help you to structure a thorough campaign. One simple tool is called SimilarWeb. You will need the Pro version to make the analysis but it is worth it. Essentially you can search for your competitors’ websites and see where they do their display advertising. This can give you an idea about potential placements for your display campaigns. Another way is YouTube which allows you to see what other videos your audience watches. To access this data, you must have run a YouTube ad campaign before. The best option is if you have data from previous Valentines campaigns or similar initiatives. If you have big enough subscriber list(over 10,000) you would be able also to learn about their demographic and interests. Again Google protects the identity of the users, this is why you need a substantial volume to get this statistics. If you get access to interests of your users you can easily target with ads particular videos and channels they tend to watch. So now you know when customers start researching and showing buying signals, what exactly they are searching for, who are they as a demographic and interests and where to find them. Have in mind that most of the tools I described are free or require minimum funds to get access to the data. Of course, there are more powerful platforms and tools, but they are expensive and complicated to get. The same strategies and tools can be applied also to other upcoming holidays like Mother’s Day, Easter, the summer Wedding Season. For more inspiration check my book “How to Advertise like a Social Media Agency”.Here you will find how to use these tools in detail, as well as many others. This entry was posted in Marketing Strategy, PPC. Bookmark the permalink.